From the depths of the Great Recession, the US economy has seen nine years of strong growth. Employment has increased, and the unemployment rate has declined to a historically low level of 4.1 percent. Wages, which were stagnant during much of this period of growth, have begun to inch up. The recent rewriting of the Federal Tax Code has spurred many employers to further sweeten the pot with bonuses, salary increases, and improved benefits. Yet, with all those positive signs, a significant number of Americans are quietly living at a level of poverty that rivals any in the world. The need appears to be so great that one Nobel Prize-winning economist has been prompted to shift his philanthropic priorities, signaling a challenge to the overall sector. US health care expenditures per capita are double the OECD.…But there are many fewer doctors and hospital beds per person than the OECD average. Americans can expect to live shorter and sicker lives. U.S. inequality levels are far higher than those in most European countries. 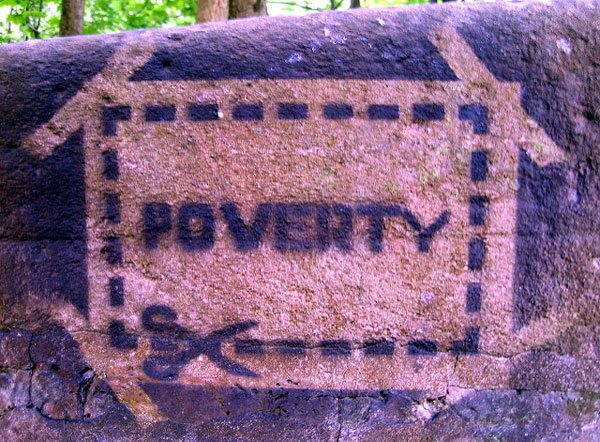 The youth poverty rate in the United States is the highest across the OECD, with one-quarter of youth living in poverty compared to less than 14 percent across the OECD. US child poverty rates are the highest amongst the six richest countries—Canada, the United Kingdom, Ireland, Sweden and Norway. Extreme need is a “high standard” when considering who needs help, even in a growing economy. A recent look at the realities of job growth by the Brookings Institution illustrates that there are many who will need assistance over the long term. Because, as Rick Cohen observed a number of years ago in NPQ, “the nonprofit sector and the infrastructure that support it are crucial delivery mechanisms for fighting concentrated poverty and social inequity—and the sources of the most effective policy and program models for state and federal policy-makers to emulate and fund. At a time when the burdens of responding to these millions of men and women who face the pain of extreme poverty and the many more who live somewhat above this level fall on the nonprofit community, the conclusion Deaton has drawn from this reality will be heartening and provide a way to reposition the need for philanthropic giving at home. For years…the needs of poor Americans (or poor Europeans) have received little priority relative to the needs of Africans or Asians. As an economist concerned with global poverty, I have long accepted this practical and ethical framework. In my own giving, I have prioritized the faraway poor over the poor at home. Recently, and especially with these insightful new data, I have come to doubt both the reasoning and the empirical support. There are millions of Americans whose suffering, through material poverty and poor health, is as bad or worse than that of the people in Africa or in Asia. Alston observed that “There is no magic recipe for eliminating extreme poverty, and each level of government must make its own good faith decisions. But at the end of the day, particularly in a rich country like the USA, the persistence of extreme poverty is a political choice made by those in power. With political will, it could readily be eliminated.” The current administration does not see those in need as a priority. On June 21st, Philip Alston, United Nations Special Rapporteur on extreme poverty and human rights will formally present his findings from a 12-day tour of the US last fall to the UN Human Rights Council in Geneva. His report paints an unflattering portrait of a country riven not only by poverty and inequality, but a deep erosion of human rights.